Industrial scale freezedryers fir CIF and SIP and auto-stoppering for vials, bulk etc. We are recognized for the supply of premium quality Freeze Dryers (Lyophilisers) ranging from 3 kg upto pilot and industrial scale models also for processing industries like food, pharma, chemical etc. Lyophiliser are used for drying of heat susceptible materials by sublimation of the pre-frozen material at low pressure and are highly durable and compatible in nature. As these are manufactured using high-grade raw material and components our products are greatly appreciated in diverse regions of the country and abroad. We have complete expertise in freeze drying technology as we are handling the products for more than 15 years now. 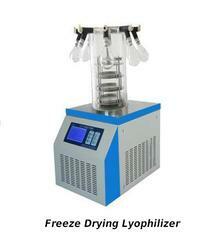 Freeze Drying Lyophilizer is applicable for freeze-drying test of laboratory samples and suitable for small amount of production. FD-10-MR include the following types: Regular type, Top-press type, multi-manifold T type and multi-manifold Top-press type. 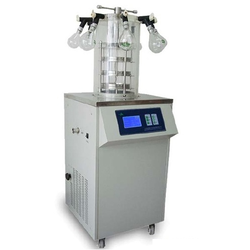 Lyophilization Freeze Dryer System is applicable for freeze-drying test of laboratory samples and suitable for small amount of production. FD-10-MR include the following types: Regular type, Top-press type, multi-manifold T type and multi-manifold Top-press type.